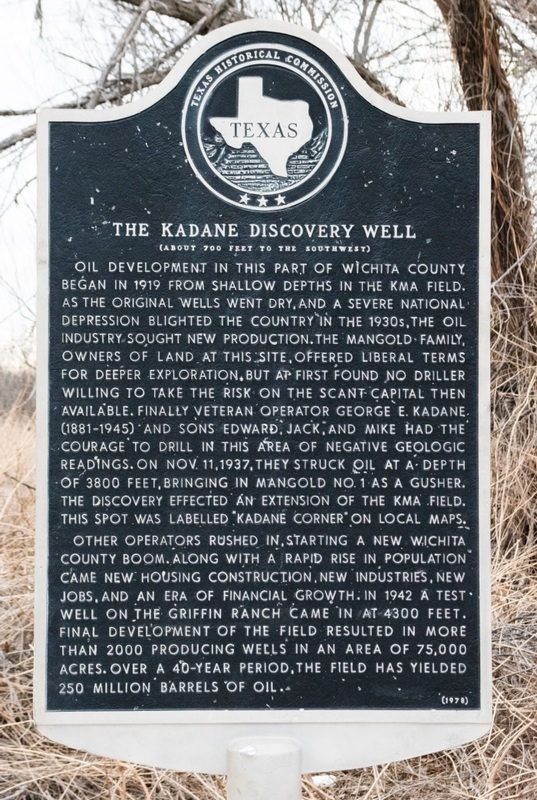 Oil development in this part of Wichita County began in 1919 from shallow depths in the KMA Field. As the original wells went dry, and a severe national Depression blighted the country in the 1930s, the oil industry sought new production. The Mangold family, owners of land at this site, offered liberal terms for deeper exploration, but at first found no driller willing to take the risk on the scant capital then available. Finally veteran operator George E. Kadane (1881-1945) and sons Edward, Jack, and Mike had the courage to drill in this area of negative geologic readings. On Nov. 11, 1937, they struck oil at a depth of 3800 feet, bringing in Mangold No. 1 as a gusher. The discovery effected an extension of the KMA Field. This spot was labeled "Kadane Corner" on local maps. Other operators rushed in, starting a new Wichita County boom. Along with a rapid rise in population came new housing construction, new industries, new jobs, and an era of financial growth. In 1942 a test well on the Griffin Ranch came in at 4300 feet. Final development of the field resulted in more than 2000 producing wells in an area of 75,000 acres. Over a 40-year period, the field has yielded 250 million barrels of oil. From Electra, the marker is located 14 miles to the south on SH25, about 1/4-mile from FM258. GPS 33-degrees 51'36.9" 98-degrees 50'20.2".